CAT 2019 Result will be Announced! CAT 2019 aspirants will get to know their result in January 2020 & since it is yet to be announced that which of IIM will conduct CAT 2019, it is difficult to predict hence, you are advised to keep watch on this space, we will keep you informed on the latest happening pertaining to CAT 2019. The CAT 2018 result has been announced. It was announced on 5th January 2019 at 10 am by IIM Calcutta on the official website. The CAT 2018 Scorecard is live now the official website https://iimcat.ac.in. You can download the scorecard till 31st January 2019. 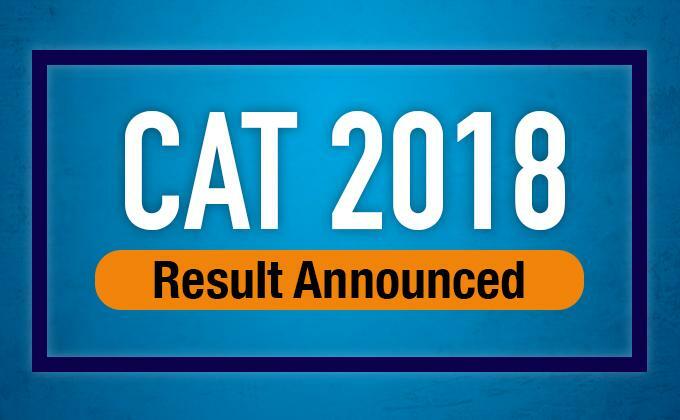 The link to check the CAT 2018 result will be made live at 1 pm on IIMCAT Official Website. *The WAT, GD and PI Rounds will be conducted individually by each of the IIMS and non-IIM colleges using the CAT 2018 score. The candidates can get their CAT 2018 exam result via SMS as well. The official SMS will be sent on the mobile number that has been used while CAT 2018 registration with all the relevant details. The CAT 2018 result is valid only for one year. The candidates can use their CAT 2018 score for all 20 IIMs and other top colleges that accept the CAT 2018 score for the 2019-21 academic session. The actual CAT 2018 score is not exactly based on the marking scheme for CAT, i.e. +3 marks for correct answer and -1 for the wrong answer. You can refer the above section to see how to calculate your CAT 2018 raw score. It also ensures that the overall CAT results are fair and equal when compared to the overall performance of the candidates across the two test sessions. Based on the normalization process a scaled score is calculated which should be close to the actual score that a candidate may get. The CAT percentile means the %age of students whose score fall below that number. The overall result is declared by the CAT organizing committee, i.e. IIM Calcutta this year. The IIMs and Non-IIM member institutes will independently decide how to use scores for CAT 2018. It is subjective to their selection process. The scores are applicable for shortlisting the candidates for their Post Graduate and Fellow Programme(s) in Management. After the CAT 2018 results are announced, the various IIMs and non-IIM colleges release the list of the candidates shortlisted for further rounds.